Congratulations to David Geearaerts for being Olympia's scramble leader of the year! 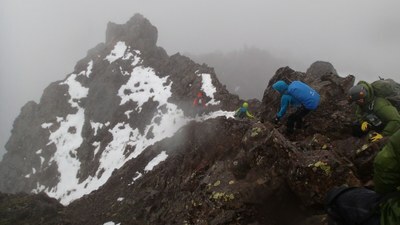 We are pleased to announce David Geeraerts as the Olympia Branch Alpine Scramble Leader of the Year. David was also selected in 2015. This year he has lead over 15 trips, and more importantly people enjoy his trips. A number of his trips were conditioners that helped many of the Alpine Scrambling and Basic Climbing students test their limits as well as meet this important milestone toward graduation. His competence as a leader has been noted by many of the participants of his trips. David is known to be fast but, as a good leader should, participants have noted that he will also dial it back a notch while still encouraging everyone to push themselves a little. Additionally, participants in David’s trips said that he encourages student development by creating learning opportunities and inviting participation in trip decisions. In addition to his training through The Mountaineers, David has completed both AIARE Level 1 and 2 avalanche training and Wilderness First Responder. Such training brings increased depth of knowledge and new perspectives to the organization. David has been in The Mountaineers only since 2013 so he has done quite a bit in a relatively short time. The Olympia Branch is fortunate to have David as a leader, and we look forward to his continued presence in various aspects of the Branch leadership. Congratulations David--an honor well deserved indeed! Yo David! Congrats and well deserved. Thank you for leading these trips and volunteering your time!